The music of this trio uses to great effect the Indian concept of tala, rhythmic time cycles of various lengths. Some of the tals employed here are Jhaptal (10), Teental (16), Kaharwa (8), and in the composition, "The Mind’s Ear", a modified Ektal (12). Other structures common to tabla playing appear like tihai, chakradar, and laggi. Porter also draws on raga, the melodic aspect of Indian music, in his compositions. For example, the "The Serpent’s Tear" is based entirely on Rag Bhairav. The integration of these elements into a modern jazz setting with sophisticated jazz harmony and improvisation makes for a rather unique sound. PAUL LEAKE grew up in New York City and traveled to Asia at a very early age, living in Nepal and India from 1967-78 and immersing himself in the languages, philosophy and music of the region. He studied tabla in Nepal with Prof. Kali Prasad Sharma (Benares school) and in Calcutta with Ustad Keramattulah Khan (Farukhabad school). After returning to New York, he became very active performing classical Indian vocal, instrumental, and dance music. Paul is a founding member of the Kathak Ensemble with dancer Janaki Patrik. Over the years he has become a central figure of the Indian music scene in New York, playing with numerous local and visiting artists as well as hosting concerts of word-class musicians. He has also composed film music and worked with various fusion groups. Paul’s vast knowledge of Hindustani music contributed greatly to this trio project. 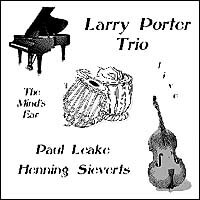 HENNING SIEVERTS was born and raised in Berlin, where he studied cello, double bass, and composition, but relocated to Munich in the mid-80s. He was a member of the Bundesjazzorchester under Peter Herbolzheimer. He won music awards from the city of Munich and the International Society of Bassists and in 1994 received the Bavarian State Prize. Henning released a CD under his own name entitled Goldfischgesänge with a trio featuring Bill Elgart and Rudi Mahall. He has toured in the U.S., Australia, and Portugal, and worked with such jazz greats as Benny Bailey, Frank Foster, Robin Eubanks, Christoph Lauer, and Jim Black.